This link with scans, should help. Reissue in white borders of the original French Limited Edition (3rd Edition FR ) was conducted in June 1995. Most cards are © 1994 , but some have been corrected during this reissue and then wear a © 1995, posing a risk of confusion with the card of the same name in the fourth edition . This is often the terminology and style of writing which allows to make a distinction . For example on "Scryb Sprites " is © 1995 in two editions, the words " Flying " in the third edition is replaced by " Flight " in the 4th edition. There are other differences, graphics those. For example white mana symbol of the 3rd Edition is significantly smaller than the one of the 4th Edition . According to my information , the risk of confusion relates only to the following cards: " Primordial Clay ", " Library of Leng ", " Black Vise ", " Scryb Sprites", "Will-o'-the-Wisp ", " Grizzly " " Island Sanctuary ", " Island Fish Jasconius ", " Nether Shadow ." 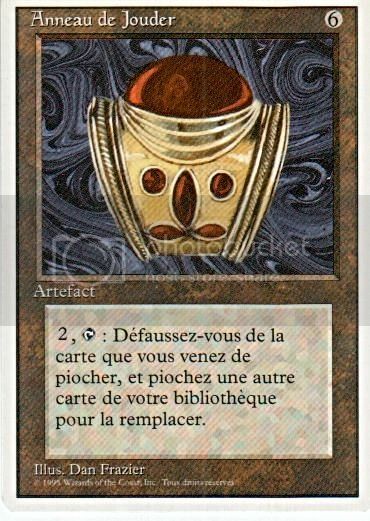 Cards "Jandor's Ring " and " Contract from Below " in this edition white borders also bear a © 1995 but were not included in the 4th edition . There thus exists a version which necessarily belongs to the third edition . Although therefore no risk of confusion , I also gives the scan here for completeness . Scans of these cards can be found on this page for reference in 3rd and 4th . Last edited by dragsamou on Sat Oct 26, 2013 5:48 pm, edited 2 times in total. Thanks, this helps with my Scryb Sprites & Library of Leng global sets. Couldn't it simply be the case that the 1995 copyright on French Unlimited is a misprint like at least German and Japanese Tainted lands from Nemesis? They have 2003 instead of 2002. Neuron wrote: Thanks for the link. I just did a translation of the French text without coffee d'oh! Are you really the translator for French Magic? For most of those cards, which set they belong to can also be identified by a slash over the lowercase i vs. a dot over the lowercase i. The only one of those cards without a lowercase i is Will-O'-the-Wisp, so that card is more difficult. Alexis, is it possible to include this info here on the Librarities site (not in the forum)? 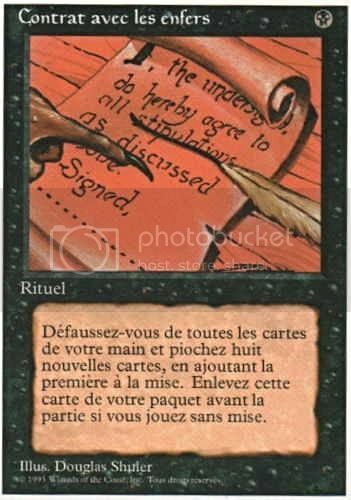 Maybe include the scans, or at least the scan of the Will-O'-the-Wisp, so that in the future when this forum thread becomes difficult to find, people will still be able to identify their cards. Putting a link to this info on the Revised page ( http://www.magiclibrarities.net/sets-re ... ition.html ) and maybe the 4th edition page would be a good idea. I know this link http://www.magiclibrarities.net/magic-s ... index.html is hard to find. That is a fair solution. Thanks! cataclysm80 wrote: That is a fair solution. Thanks! Neuron wrote: Couldn't it simply be the case that the 1995 copyright on French Unlimited is a misprint like at least German and Japanese Tainted lands from Nemesis? They have 2003 instead of 2002. 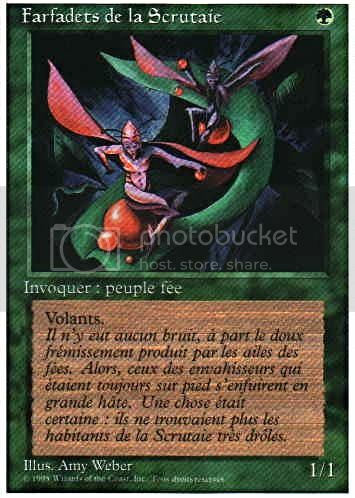 Actually, while researching a related topic, I think I've discovered why some of the cards in French Unlimited have a 1995 copyright. As the webpage above suggested, the cards that were corrected during the reissue have a 1995 copyright. I was looking through my global sets comparing cards to see what changes had been made between foreign limited and foreign unlimited. I found that German cards have lots of changes between limited and unlimited. Italian cards have quite a few changes but there are also quite a few cards that have no differances other than the tap symbol, white mana symbol, white border, and copyright date. 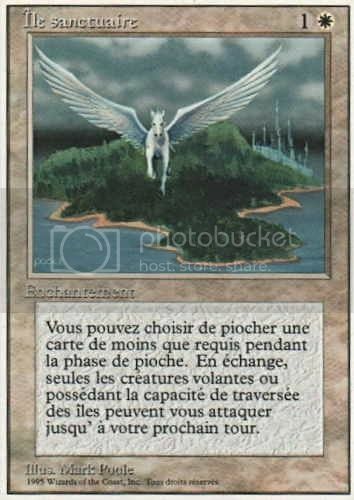 French limited compared to French unlimited is almost identicle with the only difference on the vast majority of cards being the change to white border. 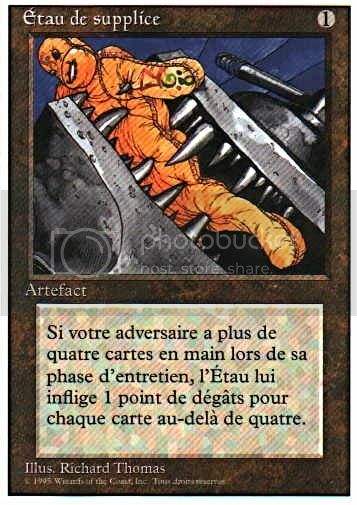 The only French unlimited cards that I could find different from the French Limited cards are these 11 cards with the 1995 copyright. The 1995 copyright is not the only difference though. 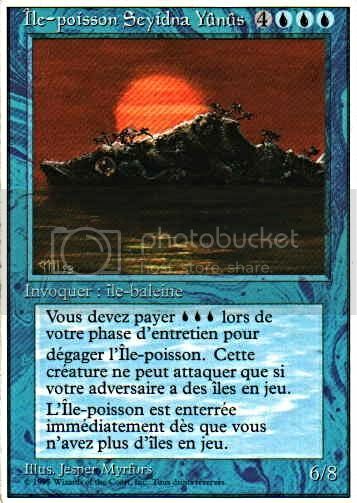 It turns out that French Unlimited was designed in 1995. 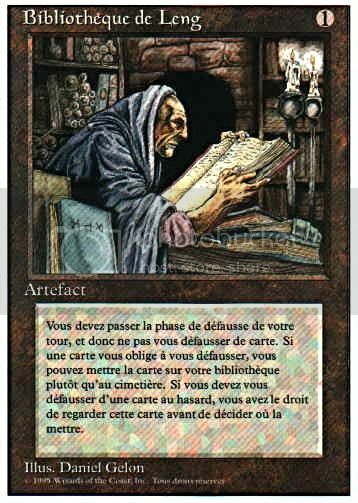 The French Unlimited designers took a short cut and used the computer files from French Limited, However, 11 cards from French Limited had errors that needed to be corrected before reprinting them. When the errors were corrected, these cards were given current 1995 copyright dates. Island Sanctuary was even given the new white mana symbol. (Island Santuary could not have received the new white mana symbol if the set had been designed in 1994.) 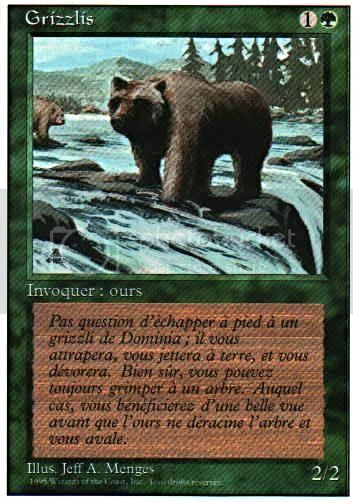 The remaining cards were reprinted just as they were in French Limited, but with white borders now. 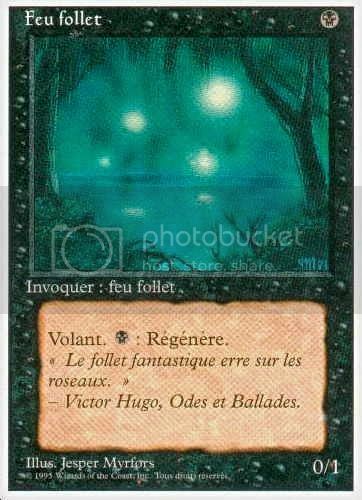 It looks like these 11 cards from French Limited are all misprints. 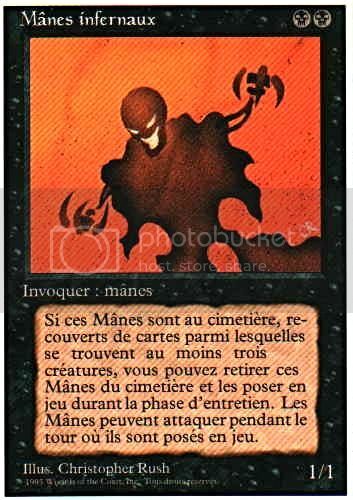 I'd also say that all of the cards in French Unlimited except these 11 are misprints as they should have all had the 1995 date and new white mana symbol if the designers job had been done properly. I wasn't able to look at every single card, but I know Alexis collects French Limited, so he can probably verify by comparing his French Limited to the French Unlimited shown in the link above to find the errors in French Limited that needed corrected. On Jandor's Ring the French Limited version was printed with Alladdin's Ring text. On Library of Leng the French Limited version was printed with une instead of d'une in the text box. 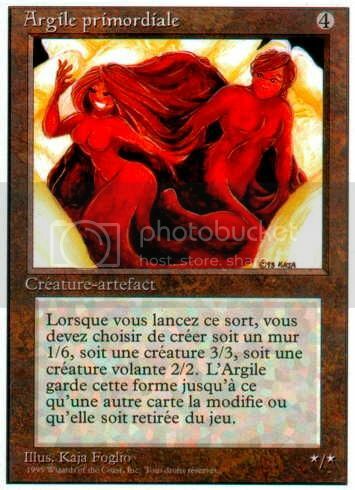 cataclysm80 wrote: I wasn't able to look at every single card, but I know Alexis collects French Limited, so he can probably verify by comparing his French Limited to the French Unlimited shown in the link above to find the errors in French Limited that needed corrected. de dégâts pour chaque carte au-delà de quatre. partie si vous jouez sans mise. que vous n'avez plus d'îles en jeu. -Les Mille et une Nuits, trad. Mardrus. le tour où elles sont posées en jeu. - Victor Hugo, Odes et Ballades. elles sont posées en jeu. / ils sont posés en jeu.